Join us for this interactive web workshop where we will demonstrate 3D image processing and analysis using Simpleware software. We will also you through the workflow of building high-quality models for advanced analysis of anatomies, implants, medical devices, and surgical techniques. 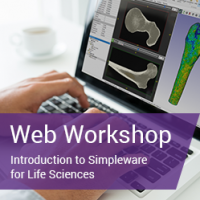 This web workshop features a live demonstration of Simpleware software where you will learn how to visualize and process your 3D image data and integrating CAD-designed medical devices. You are welcome to ask questions and chat with our team of Application Engineers throughout the workshop.